Mikado – Tasty pick up sticks! 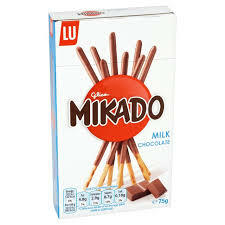 I wanted to find a chocolatey snack that satisfied my cravings, but wasn’t too high in points, I think Mikado is the one! They are thin biscuit sticks with 3/4 of the length covered in chocolate. I started off with the milk chocolate flavour but have since tried and fallen in love with the white chocolate ones, as they remind me of some delicious chocolate snack from the past (I’m not sure what!? Answers on a postcard!). 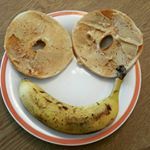 The fact that you can eat 4 sticks for just 2 Smartpoints is great, and if you have more points then you can have lots! I would say that these are better than the mini Green & Black bars (4sp) because they last a bit longer so you feel like they are better value for points. 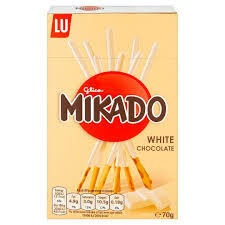 Research into the name ‘Mikado’ has interestingly revealed that these snacks were originally created in Japan in 1966 and were called ‘Pocky’. Only in Europe are they named after the pick up sticks game which they resemble!